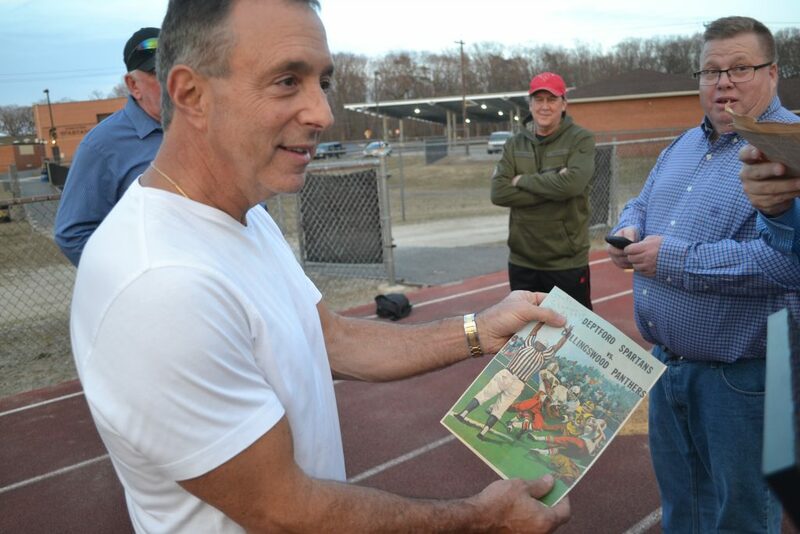 As the sun began to set behind the home bleachers, providing a Spartan golden hue over the lonely gridiron, the conversations came easy for a half dozen people linked by a season few in Deptford Township will ever forget. It doesn’t matter how many decades go by (it’s now four, for anyone counting). It doesn’t matter if some move down the shore or others are often too busy with work. They still find each other. And when they do, the stories are endless because they were making history back then, in the fall of 1978. Their memories are still vivid, as if they were only a few years removed and in their early 20s and not their late 50s. 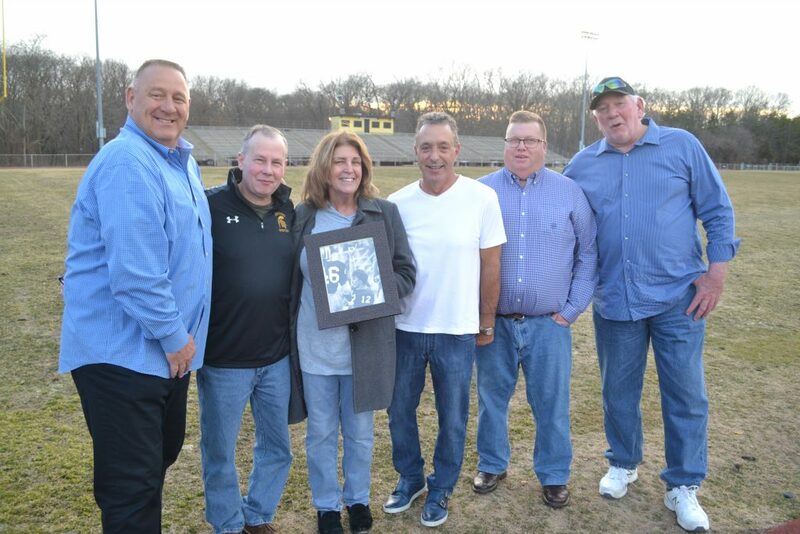 On Thursday, March 13, 40 years, 3 months and 12 days since they finished an undefeated season with a 14-0 win over Collingswood for the South Jersey Group III championship, they reminisced. 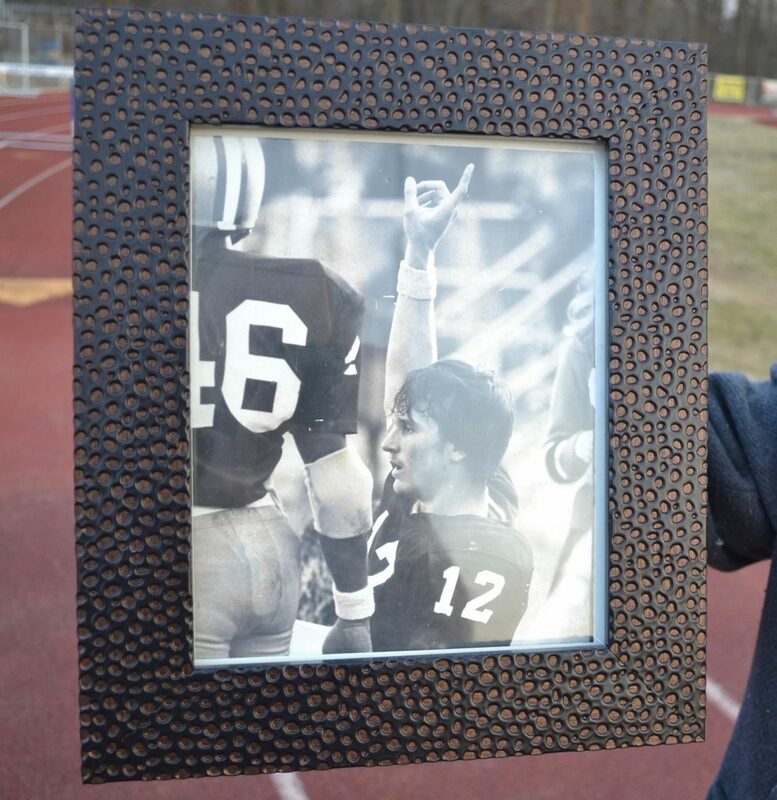 They gathered at their alma mater’s football field, shared memories, and made new ones, too. 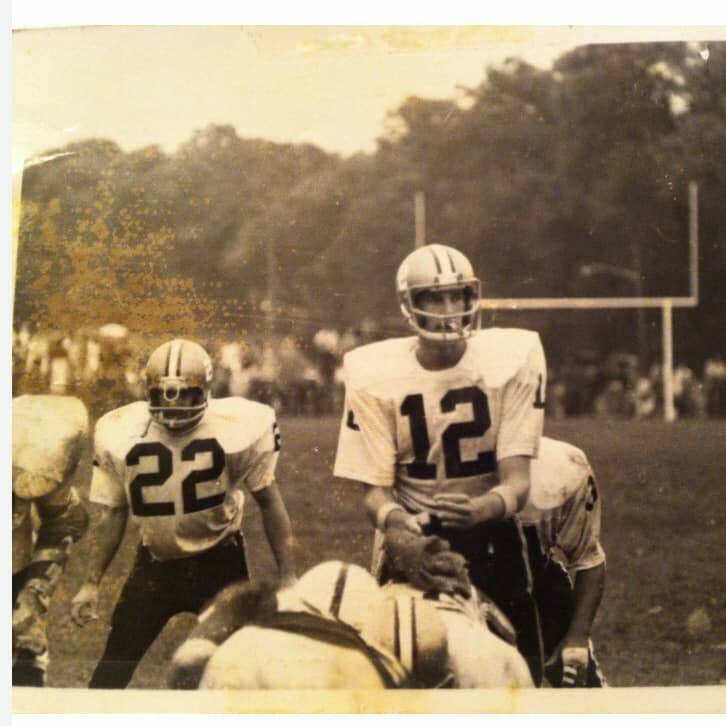 The Spartan football heroes will gather again at Auletto’s on March 26 for the annual Gloucester County Sports Hall of Fame banquet, where they’ll be honored and when one of their own will be a part of the 2019 induction class: Daniel Greene, the quarterback and leader of the 1978 Deptford championship team. Unfortunately Greene’s honor is a posthumous one. He passed away 11 summers ago, at 47 years old, of a heart ailment. In July of 2008, on their way from the viewing to the funeral in Mickleton, Wilson, McKenna, and Anthony “Dooley” Rastelli hatched a plan to remember their friend. This spring, the 8th Annual Danny Greene Memorial Golf Outing will bring the band of brothers together again at Riverwinds in West Deptford. The event honors Greene and other fallen members of the community with all of the proceeds supporting Deptford youth organizations. The impromptu meeting last week wasn’t a somber one, though. The smiles were contagious for Wilson, Rastelli, McKenna, Orio, Mike Beers, and Greene’s widow, Nancy Greene-Hagan, as they told stories of their friends and recalled memories on the field behind them. Like the family atmosphere created by late, beloved head coach Joe Corbi, who many credited for breaking down racial barriers within the program a few years earlier. Or about the time Corbi and his coaching staff pulled the seniors into the office after a pre-season practice in ‘78. “The thing I remember, and I’d tell my kids, is we were out there in practice hitting so hard, and one day (the coaches) brought the captains in, remember that?” Orio said. The intense competitiveness in August practices gave way to a physically imposing and dominating team in September through December, led by a quarterback with a unique skill set that included mental toughness, football and book smarts, and sheer physical talent. 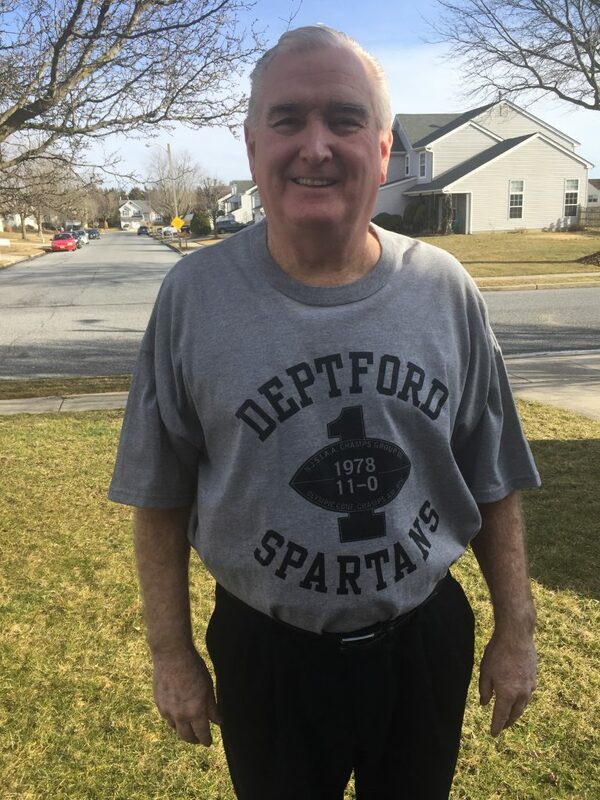 After leading Deptford to its championship win in December of 1978 and graduating in June of ’79, Greene made more history: he joined four his his Spartans teammates, including soon-to-be-roommate Tony Orio, at Villanova University. It was the first time in NCAA history five high school teammates would go on to play Division-I football together. After Villanova dropped its football program in 1981, Greene transferred to the University of Georgia and Nancy moved south with him. Last week, with a framed picture of her late husband in her hand and his lifelong friends by her side, Nancy Greene-Hagan paged through scrapbooks he had kept, which included old newspaper clips, team photos, and even a 1978 game program from the Group 3 championship game. Daniel Greene’s widow will give the acceptance speech at Auletto’s a week from Tuesday. The couple’s daughters, Morgan and Courtney, will be there, too. Before the hourlong, mini-reunion was over last week, Greene-Hagan shared one more memory of her late husband: two weeks before he died, on the night of July 4, just before midnight, the couple was on their way back from a Independence Day fireworks show in Philadelphia when Greene noticed a man broke down on the side of the road. He told his wife they should turn around and help out. The man was out of gas, and so Greene told him to stay put, made a run to find a station still open, filled up a portable tank, brought it back to the man and refused anything from the man’s wallet. The 39th Annual Gloucester County Sports Hall of Fame Banquet will be held on March 26 at 6:30 p.m. at Auletto’s. Tickets are $42. For additional information, contact Gus Ostrum at (609) 502-0424. The Danny Greene 8th Annual Memorial Golf Outing will take place on April 29 at Riverwinds. Check-in is at 7:30 a.m. with a Shotgun Start at 8:30 a.m. Buffet and beverages at Adelphia’s afterward. The cost is $100 for golfers and $40 for non-golfers. For more info, contact Joe McKenna at 609-923-7866 or dannygreenememorial@gmail.com.